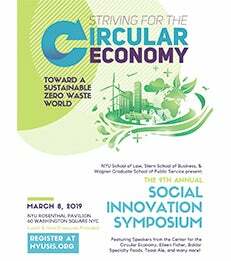 On March 8, the social enterprise student organizations of New York University’s Leonard N. Stern School of Business, School of Law and Robert F. Wagner Graduate School of Public Service will host the 9th Annual NYU Social Innovation Symposium (SIS), featuring the theme, “Striving for the Circular Economy.” The Symposium will feature keynote speaker, Tom Szaky, CEO of TerraCycle. Professionals and speakers from an array of organizations, from law firms to policymakers to nonprofits and private enterprises, will discuss how to move towards a more sustainable future. For more information, including an agenda, please visit the event website.